An Indian Origin scientist has created a small fuel-cell that could one day be used in our homes to deliver electricity. K.R. Sridhar from Silicon Valley’s Bloom Energy has developed the device. Those two blocks can power the average high-consumption American home — one block can power the average European home. At least that’s the claim being made by K.R. 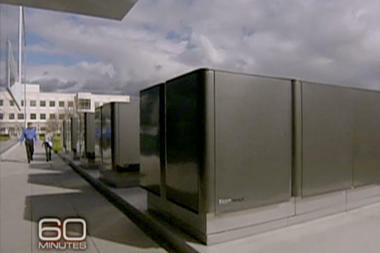 Sridhar, founder of Bloom Energy, on 60 Minutes last night. The original technology comes from an oxygen generator meant for a scrapped NASA Mars program that’s been converted, with the help of an estimated $400 million in private funding, into a fuel cell. Bloom’s design feeds oxygen into one side of a cell while fuel (natural gas, bio gas from landfill waste, solar, etc) is supplied to the other side to provide the chemical reaction required for power. The cells themselves are inexpensive ceramic disks painted with a secret green “ink” on one side and a black “ink” on the other. The disks are separated by a cheap metal alloy, instead of more precious metals like platinum, and stacked into a cube of varying capabilities — a stack of 64 can power a small business like Starbucks. At the heart of the Bloom Box will be solid oxide fuel cells-in this case, flat, coaster-size ceramic plates with a secret coating-widely considered by experts to be one of the most efficient types of fuel cells. is not revolutionary, nor is it the cheapest or most efficient fuel cell system available. “It’s a big hype. I’m actually pretty pissed off about it, to be quite honest,” said Nigel Sammes, a ceramic engineer and fuel cell expert at the Colorado School of Mines. “It really is nothing new. Go to any (solid oxide fuel cell) Web site and you’ll see the same stuff,” he said. Mike Brown, a vice president at fuel cell maker UTC Power-a competitor to Bloom Energy-also wasn’t surprised. “I think we had anticipated just about everything that’s on their Web site,” Brown said. “But it’s nice to at least finally see something after ten years, which is about how long the Bloom Box has been in development,” he added. According to Friedrich Prinz, a fuel cell expert at Stanford University, the design of the Bloom Box appears to be fairly standard and that there was nothing obviously revolutionary about it. “They didn’t reveal any new physics or any new principles, but I don’t think they need to do that,” he said.